The petro supposedly raised $735 million in the first day of its presale, but there are still questions to be asked. People are looking to cryptocurrency to solve all kinds of problems, from making sure that photographers get paid for their work, to addressing carbon emissions. 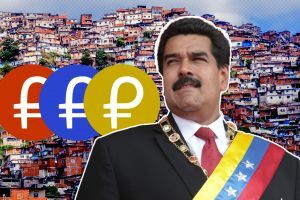 Now the Venezuelan government hopes that a new digital coin might be able to counteract the country’s economic collapse. As extreme inflation drags the Venezuelan bolívar down, food and medicines are scarce, crime is rife, and essential public services have buckled under the strain. Many residents have already fled the country. The new digital currency – dubbed the petro, in reference to its value being based on the price of oil – is the government’s last-ditch attempt to stem the flow. Why do crypto companies run initial coin offerings? Because they are a great way to raise a lot of money quickly, and that’s exactly what Venezuela needs to pay off its debt. President Nicolas Maduro claims that the petro raised $735 million in the first day of its presale, as per CNBC. If that number is to be believed, the project off to a great start. Wisely, the petro seems to be leveraging existing crypto technology, rather than starting from scratch with its own bespoke exchange platform. Venezuela does have plans to eventually open its own exchange, but the coin will also be traded on others. What’s more, the petro is based on proven blockchain technology – although its white paper and its buyer’s manual disagree on whether it’s built on Ethereum or NEM, as noted in a report from CoinDesk. The Trump administration has introduced sanctions that prevent the purchase of new securities issued by the Venezuelan government in the American market, according to a report by The New York Times. The petro offers investors a way to sidestep these measures. Cryptocurrency can be volatile, and Venezuela is the first country to create its own digital currency in this manner. While various other nations are pursuing crypto, these projects are not desperate measures to save the future of the national economy. It remains to be seen whether the petro will woo investors. People need a reason to invest in this untested coin – and given that the lack of ties to a central government has paid into the popularity of bitcoin and its ilk, the petro already has a mark against it.